Having crossed the first hurdle, India will seek a happy ending to a bitter tour by clinching their first-ever tri-series title in Australia as they go into the second finals against the world champions at the Gabba here tomorrow. India will depend on in-form batsmen like Rohit Sharma to deliver in the crucial match on Tuesday. Australia's coach Tim Nielsen today admitted that his team's star-studded batting line-up is low on confidence before the second final of the cricket tri-series against India here tomorrow. After being comprehensively outplayed by India in the first final of the CB series, Australian captain Ricky Ponting has demanded an improved performance from his team mates in the second final at Brisbane tomorrow. A section of Australian newspapers alleged that Harbhajan Singh made monkey gestures to the crowd at the Sydney Cricket Ground on Sunday. The match referee, Jeff Crowe has dismissed the charge. So, the issue is really closed. However, people need to be aware that Australian papers have been conspiring with their cricketers to apply pressure on their opponents since time immemorial. The Pakistan Cricket Board (PCB) refused to support India's bid to get a total ban imposed on sledging when the issue was discussed at the ICC chief executives' meeting in Kuala Lumpur last month. The triumphant India Under-19 World Cup squad is to be accorded a rousing welcome in Bangalore tomorrow after the team members touch down by a special chartered flight at 4 pm. South Africa inflicted a humiliating innings and 205 runs defeat on Bangladesh on the fourth day of the second and final Test here today. Chief Coach Joaquim Carvalho today described India's 7-3 win against Austria as a "tough" one but felt it would help his team to shape up for the remaining league matches against challenging opponents. Amit Mishra picked up three wickets as Haryana defeated Delhi by 27 runs in a low-scoring encounter of the Ranji Trophy one-day cricket tournament here today. India recovered from a shaky start to beat Austria 7-3 for their second consecutive win in the World Hockey Olympic qualifying tournament at the Prince of Wales Country Club here. Rocked by a second-minute goal, India bounced back in a splendid fashion as Dilip Tirkey (9th, 23rd), Shivendra Singh (51st, 55th), Ignace Tirkey (42nd), Bharat Chhikara (53rd) and Rajpal Singh (53rd) struck telling blows. World number four Jelena Jankovic of Serbia is disappointed that home challenger Sania Mirza is not playing in the WTA Bangalore Open here. Jankovic said she would miss Sania in the tournament as the Indian ace was a nice person off-the-court. India, just one match away from claiming the historic feat after they won the first match of the best-of-three finals at SCG yesterday, will be looking to carry the momentum in what promises to be another thrilling day-night encounter. Mahendra Singh Dhoni and his men would be on a mission, especially after the sub-continent giants were beaten in the controversial Test series and being at the receiving end of a series of provocations by the Australian cricketers. India, however, may have to do without the services of their new pace sensation Ishant Sharma who suffered a finger injury in the first finals. Sharma still carries a swelling on his right middle finger and has been rendered a doubtful starter for the crucial game. Fortunately though India has capable medium-pacers in Sreesanth and Munaf Patel in reserve. Young Praveen Kumar has shown an ability to withstand battering from the rival ranks and Irfan Pathan's off-form the other night is seen only as a one-off situation. The four, along with Harbhajan Singh, could answer to the call of five bowlers and leg-spinner Piyush Chawla, despite his brilliant return of none for 33 from 10 overs, could be put on bench. India's batting is also coming together at the right time and frankly, on form if not on reputation, the visitors look a better side than the hosts. India is bowling and fielding with energy in the field and their batsmen are putting on runs and stands which will test Australia's well-earned reputation to bounce back to the full. Three of the top five wicket-takers in the series are Australians but strangely all three - Brett Lee, Nathan Bracken and Mitchell Johnson - were put to sword by rampaging Indian batsmen last night. Australia pride themselves in playing the big games well which they would now be required to do twice over the remaining week. Australia will be desperate for return of form of their key players - Ricky Ponting and Andrew Symonds. Opener Adam Gilchrist too, despite his couple of flourishes, has largely been a failure in the series. For somebody who has been part of the most successful cricket teams of all ages, it would be ironical if Gilchrist in his departing series is witness to an unlikely loss to the Indians in the finals. The pitch at Gabba is rated as one of the best for one-day cricket in Australia though with winter setting in, no team would prefer chasing under lights. The Indians, on the other hand, feel besieged and stirred at the same time as all hell has broken loose in Australian media about Harbhajan's apparent mimicry of a monkey of which, strangely, no evidence exists. As Australian media make one last attempt to hound out Harbhajan from the game, the Indian off-spinner is keeping his cool and relishing his success, the latest chapter of which was scripted in the first finals in Sydney'a poetic justice as his two scalps include his two most bitter provocateurs, Matthew Hayden and Andrew Symonds. Harbhajan has claimed only seven wickets from nine games in the series so far but his average (33.28) and the superb economy rate of 4.22 per over has meant that he is a shining exception of a spinner in a series out-and-out dominated by the faster men. Much as competitive cricket between the two sides have kept the fans enthralled, the never-ending controversy in the background have ensured that the rivals would probably never come to sit and share a drink in the bar, except possibly for when they are arranged for their franchisees to be showcased in the Indian Premier League (IPL). "You would be unhuman not to have a little bit of a hit with the confidence when you are not getting the results you are looking for," Nielsen said at a press conference on the eve of the match. Nielsen said the main challenge before his side would be to get rid of the mental block against the Indian bowlers. "That is the challenge of elite sport. You are not always going to get the result you want. We are playing against a bowling attack who are bowling very well. Our challenge at the moment is to keep these blokes up and get them in a state of mind which gives them every chance tomorrow. "While we are not playing as well as we would have liked, we have 24 hours to sort it out," he said. Nielsen said the recent reverses in hands of India had created self-doubts in the minds of the Australian players. "It's one of those funny situations where they feel as if they are hitting the ball quite well and going about things pretty well,", he said. "It is the mental side of the game which is letting us down a little bit over the last couple of games," Nielsen said. Nielsen's first year as a coach has involved a few off-field controversies which have caught him off guard. "There have been a couple of things I probably have not expected and it certainly added to the whole dynamics of the job. ''All of us individually have to go away and think about where we went wrong in this game and look at areas we can improve. I've already spoken to the guys about that and I'm expecting a better performance from us tomorrow,'' Ponting said. 'India certainly outplayed us in most areas and well done to them,'' he said. However, the 33-year-old Tasmanian said the Indian team should be high on confidence after the Sydney win but his players will come hard at the visitors. ''India have got their noses in front and we've got a lot of work to do. We're going to have to lift ourselves even more than we did today for tomorrow's game. ''That's the challenge that lies ahead of us. The resilience of our team is unquestionable,'' he said. ''We've been in this position before and we pride ourselves on the way we play in finals and I think you can expect us to bounce back pretty quickly,'' he added. Sachin Tendulkar, who scored a match-winning century here yesterday, too, believes that India should be ready for a backlash from the Australians but said his team has the ammunition to counter the hosts' challenge. 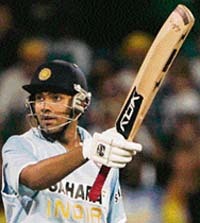 ''To beat them is extremely important and now we have to beat them a second time,'' Tendulkar said. ''Australia will be very determined to take the series to a third game but, hopefully, we can get the job done again. The tabloids now lead the agenda and the broadsheets follow. One can understand the popular press whipping up controversy, but for the Sydney Morning Herald and The Age of Melbourne to follow is disappointing. Perhaps, such jingoism increases circulation. Not being privy to photographs the Sydney Morning Herald is said to have in its possession nor any unbroadcast footage of Channel Nine, one cannot comment on these. But the aired C9 pictures clearly suggest that the crowd were giving Harbhajan a hard time, as has been the case ever since Justice John Hansen struck down the ban earlier imposed on him by match referee, Mike Procter. Furthermore, spitting to clear one’s throat is a widespread practice among cricketers on the field. And scratching is also perfectly normal human nature. Nothing ulterior can be read into either. Therefore, the attack on Harbhajan reflects the immature and irresponsible nature of Australian newspapers, one of which, the Courier Mail, being a publication in Queensland, where Andrew Symonds and Mathew Hayden hail, is perhaps attempting to appease its readers. Queensland has historically been the most right-wing and racist of Australian states, even having pro-Nazis as political leaders in the past. There is strong suspicion that Symonds, smarting under the insults heaped on him by spectators in India (and it should be stressed that this was wholly unacceptable), was desperately looking for revenge. Harbhajan, a prickly character as far as the Australians are concerned, became the target in the now infamous 2nd Test at Sydney in early January. As for Hayden, a buddy of Symonds, he can’t seem to resist poking his nose. He gave evidence in support of Symonds’ accusations, which was rejected by Justice Hansen, because while he claimed to have heard what Harbhajan allegedly said, he, incredibly, had no memory of what Symonds had uttered in the same exchange. His remarks in a Brisbane radio programme since were undoubtedly uncalled for; and in the strictest sense, were racist. But the unpleasantness on show in the last couple of months also mirrors a clash of cultures. In the Anglo-Saxon realm being called a “bad boy” can even be taken as a compliment, for young people in this sphere take pride in being naughty, a rebel. Non-westernised Indian norms can be different. You are expected to be a good boy and defined as such. Therefore, if Harbhajan took offence at being labelled a “bad boy” and got worked up about this, this is hardly surprising. In short, Australians and Indians cricketers must understand they emerge from contrary backgrounds; and need to think before they react. However, the dirty tricks of the Australian press and the over-reaction of a part of Indian media are both unnecessary interferences. As for sledging, this is fine as long as it’s not foul-mouthed. Indeed, humour and sarcasm in the middle contribute to cricket being a way of life and not just a sport. The BCCI had proposed a ban on sledging after a spate of unsavoury incidents between the Indian and Australian players in their ongoing series. But it was decided at the Chief Executives' meeting that umpires will use the ICC's existing code of conduct to decide whether a verbal exchange between players falls into the category of abuse. A PCB official said India had introduced the proposal for ban on sledging but Pakistan's stand was that the ICC code of conduct had enough clauses to deal with the issue. "We just feel sledging is a relative thing and although it should never allowed to go out of hand but umpires should use the context of a match or series and its location to determine what constitutes sledging," the official said. The PCB has been taking a lot of flak from former players and critics in recent days for its unstinted support and to every decision of the Indian board particularly over the Indian Premier League and Indian Cricket League. The member countries have agreed that ICC will take a zero-tolerance approach to sledging. The team led by Virat Kohli defeated South Africa by 12 runs by the D/L method in a rain-affected final at Kuala Lumpur yesterday to regain the Under-19 world crown after eight years. Bangladesh batsman Aftab Ahmed, who had injured his cheekbone yesterday, did not come out to bat, compounding the miseries for the hosts who struggled right through the hopelessly one-sided contest at the Chittagong Divisional stadium. Fall of wickets: 1-0, 2-44, 3-45, 4-49, 5-54, 6-58, 7-58, 8-114, 9-119. "Maybe our team needed a wake-up call and when Austria held us to 2-2, we realised we had a match on hand," Carvalho said in the post-match press conference. Haryana made 258 for seven in their 50 overs with Sunny Singh (59), Kamal Beniwal (52) and Amardeep Sonkar (42) playing crucial knocks at the Feroze Shah Kotla stadium here. In reply, Delhi could only manage 232 for nine in their 50 overs. In the other matches played here today, Himachal Pradesh defeated Jammu and Kashmir by a massive 105 runs at the Harbaksh Stadium. HP set a target of 213 for J&K with Paras Dogra's 77 being the highlight of their otherwise ordinary batting display. Later, Vishal Bhatia's six-wicket haul for a mere 15 runs broke the back of J&K batting which was folded for 108 in 33 overs. Meanwhile, in yet another low-scoring match, Punjab successfully chased down a paltry target of 153 set by Services. Austria, who went into the lead when Robert Buchta scrambled the ball in from a counter-attack in the second minute, kept India on their toes with two penalty corner conversions by Christian Minar (28th, 59th). India, after a poor start with their midfield play in tatters, made up for their first-half lapses with splendid attacking hockey in the second-half when they scored five goals in 13 minutes to take the game away from the Austrians. Indians were surprisingly tentative against the European outfit that solely depended on quick counter-attacks which fetched them no fewer than seven penalty corners. But the Austrian penalty corner drill was rather predictable and the Indians were rather fortunate to get away lightly. For much of the first-half, the Austrians matched their fancied rivals move for move and goal for goal giving the Indians many an anxious moment. However, with change of ends, the complexion of the game turned dramatically with India going on the rampage. "I am disappointed with Sania Mirza's pull out from this event. She is a nice person off the court. She has been doing well on the tour and I hope she will keep improving," Jankovic said at a press conference here today. On her personal ambition, Jankovic said she would love to win an Olympic medal for her country. "Olympic is always special and emotional one because you represent your country and you will be surrounded by best athletes. I hope I can bag a medal this year. I want to give my country something," she said. However, becoming No.1 in the world is the Serbian's ultimate dream. Jankovic, who won five singles titles last season besides the mixed doubles one in Wimbledon, said "achieving the number one rank is my dream. I grew up thinking about that. I am working hard to achieve it. If I win a Grand Slam it will take me closer to that top spot." The 22-year-old Belgrade-born player hopes for much better results this year. "I had a great season last year. It was a learning experience. I am working a lot this year and I hope to continue it this is year as well. I am hoping for much better results this year. I played lot of tournaments last year and won a lot, but this season I am going to concentrate only on bigger tournaments. I am going to try and prove out there." 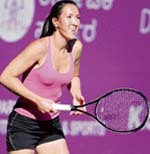 Jankovic said she is still on the lookout for a good coach to improve upon her game. "I am looking for a coach and I think a coach can help me achieve my potential. There is lot of room for improvements in my game and I hope the new coach will help me improve it. It's very tough to find coaches these days. Most of them don't want to travel and be with their family.